Flea & Tick prevention is a requirement. You MUST have proof of this treatment. Precious Pets is an open and free environment. 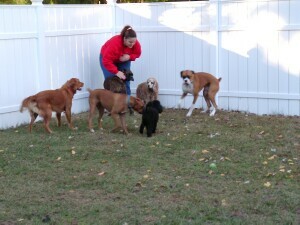 We encourage the dogs to play and socialize together. During these activities it is possible that the dogs may sustain minor nicks, cuts, scrapes or abrasions. Also your dog’s stay it may come in contact with animal feces in the suite or the playground. If in “direct” contact with animal feces, it’s possible that some dogs may have a reaction to the parasite. Even though every effort is made to insure that your dog eats the provided food or treats, it is possible to eat its’ roommates food. Many dogs share the same water bowls. The bowls are cleaned multiple times a day but there is still a chance that bacteria can be transferred through the water. Precious Pets is not responsible for kennel cough, diarrhea, fleas or ticks. Nor are we responsible for any medical expenses.